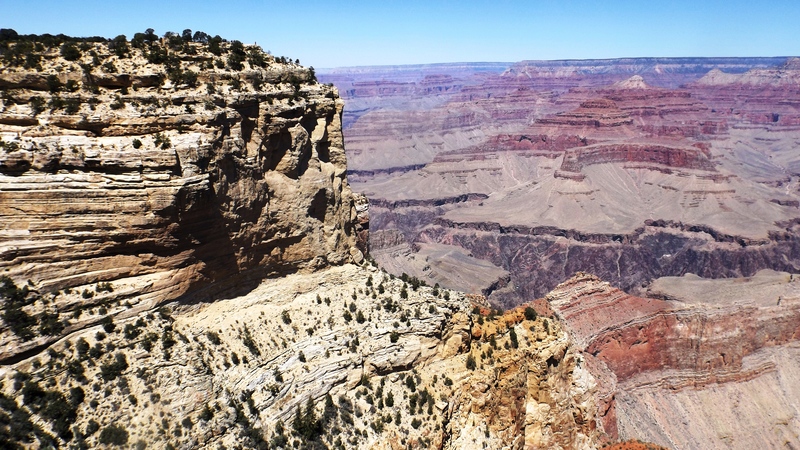 The Park Service operates free shuttles on a convenient schedule around Grand Canyon. We used the Blue Route our first day working our way around Grand Canyon Village, the most developed part of the park. Our second day of serious touring called for a ride on the Red Route, also known as Hermits Rest Road. 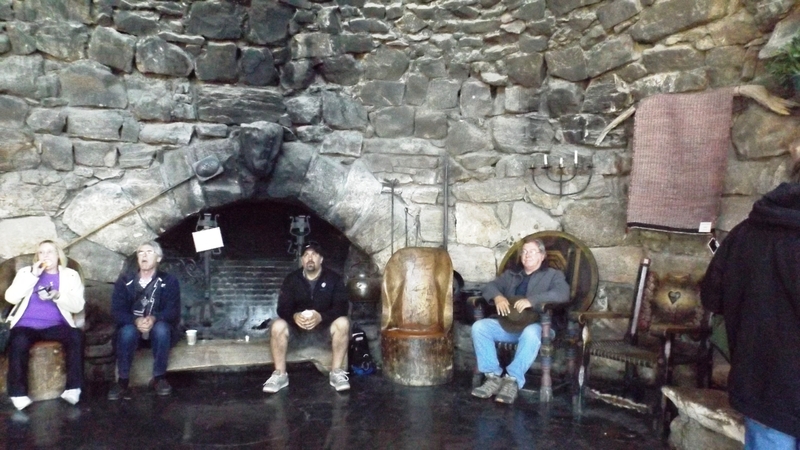 There are few rest stops and only one water station on the Hermits Rest Road, and blessedly, just one gift shop. 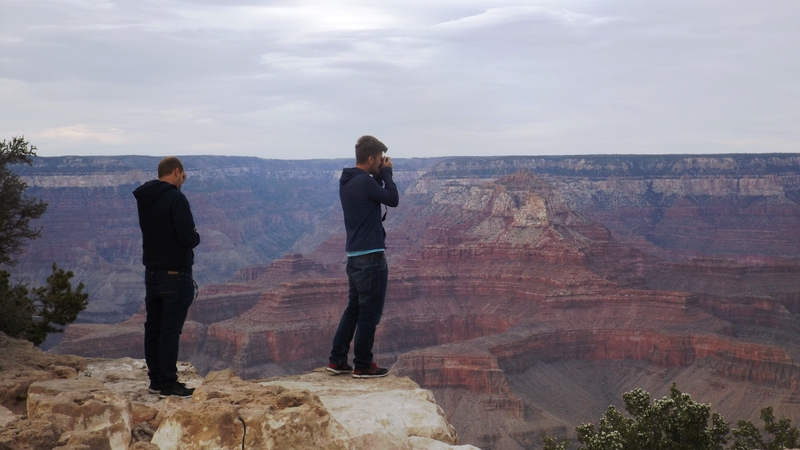 The other ten stops are scenic overlooks and tremendous views of the Canyon from various perspectives. 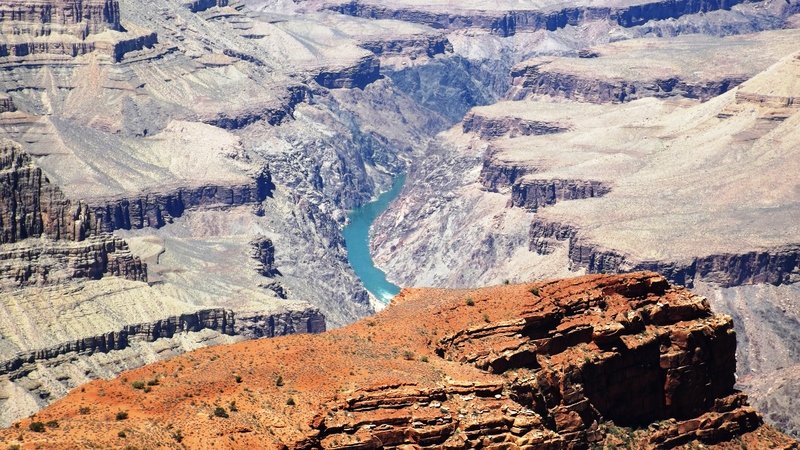 You get some excellent looks at the Colorado River from Hopi and Maricopa Points, with outstanding canyon wall views from Mohave Point. The Abyss is just off the edge of the Red Route, and from there it’s 2,000 feet straight down. That did not deter some from perching on its edge and leaning way out; we had to turn and look away more than once. Our young overseas guests seem fascinated by the risks of posing for photos upon the edges of cracked ledges while 30 mph wind gusts blow their hair every which way. One fool pretended to lose her balance on a barrier wall with ten miles of emptiness as her background. If that picture turns out, she doesn’t need tattoos. That photo is permanent proof of temporary insanity. The Hermits Rest is a Mary Jane Colter original. She is the mother of what has come to be known as the “National Park Rustic” school of architecture in which man-made buildings echo their surroundings. Her creations often had fantasy themes, and Hermits Rest fits the bill. It was built in 1914 as a road house for food and drink at the end of the Canyon stagecoach tour. Before being used even once, she made it look like the worn and smoky residence of a real hermit. She also designed the Bright Angel Lodge, the Lookout Studio, and The Watch Tower, another big one to be featured in our next blog. 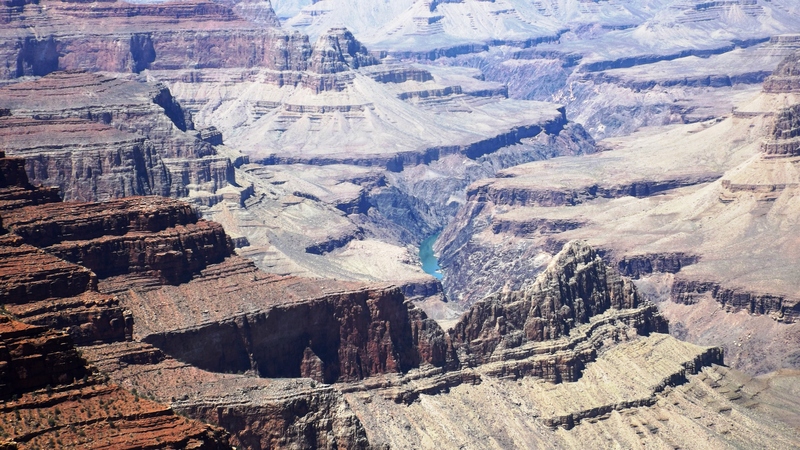 The theme for Grand Canyon might be “The Power of Nature”. I was amazed to learn from a Park Service sign at Mojave Point that only 500,000 years ago a volcano erupted and poured enough lava into the Colorado River to form a wide and deep lava dam. It took the river 3,000 years to break that dam after forming a lake with the volume of one of the smaller Great Lakes. The remnants of that dam remain, though badly eroded, and the broken pieces of the dam present challenges far downstream to river rafters. After all, without boulders, there can be no white water. Glad you liked it, Nanner. But wait: there’s more to come. I haven’t even got to the orange shuttle and Desert View Road yet, never mind Shrine of the Ages!